Pocket Tutor: Wilderness Survival, 2001, by James Kavanagh, illustrated by Raymond Leung. Compact, laminated survival guide, profusely illustrated in color. 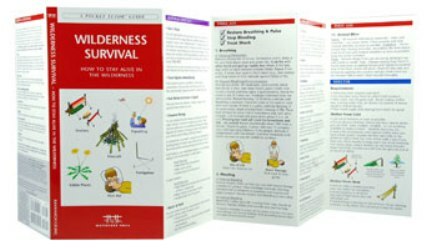 Covers survival strategy, basic first aid, shelter, signals, water, fire, food, hazards and navigation. Folded to 4” x 8 ¼,” opens out to six 4” panels.